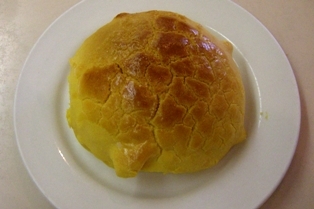 10 Requirements for the perfect Bor Lor Bau. 1. Overall presentation: Expert craftmanship. 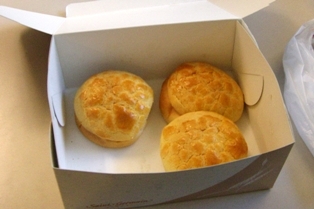 Artisan, no two buns look the same. Large crust had a very natural look of being oven-baked with precision timing: a golden-yellow that isn’t too pale, or burnt. A mild but beckoning glaze with no oily sheen. 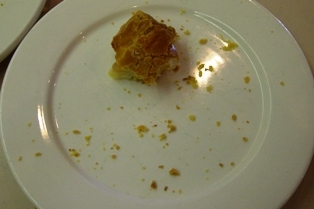 Crust had good amount of visible crackling resembling a pineapple, and did not look artificial. 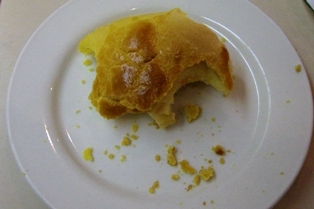 No giant crevices in crust exposing bun underneath, no holes and imperfections where pieces of crust had fallen off. Appealing dome-shape with great height, no deflation, does not look like a rock. Smells sweet and fresh. 2. Bun texture: Delicate – very, very soft, airy and light, doesn’t feel like you are chewing on and on forever. Not at all doughy or oily. 3. 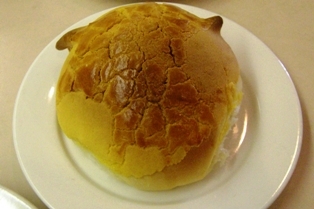 Bun taste: Subtly sweet accompaniment – bun itself doesn’t overpower the crust, but is not flavorless. 4. 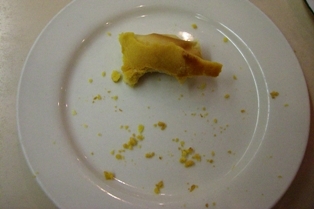 Crust thickness: Just right – is not super thick, nor “skin-like” and peeling. Consistent throughout (with slight imperfections here and there, avoiding an artificial-feel). 5. 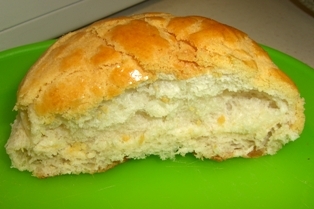 Crust moistness: Perfect combination – Not soggy, or disgustingly cakey or powdery dry like a biscuit. Slightly crunchy on the exterior to create the tiniest of “impact” as you bite on it, with a tiny hint of sugary moistness underneath. 6. 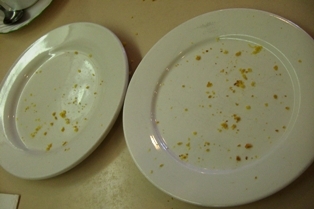 Crust adherence to bun: Excellent semi-adherence – ie. will only fall off naturally and in small bits where it is disturbed, but resistant to simple touching and lifting. Is not glued to the bun like skin, but also no giant chunks flying off every which way as you eat or hold it, leaving you with a plateful (or lapful) of crust, and a naked bun (big no-no). 8. Crust sweetness: Heavenly – not a mouthful of powdered sugar. Does not induce that overly-sweet headachey feeling. 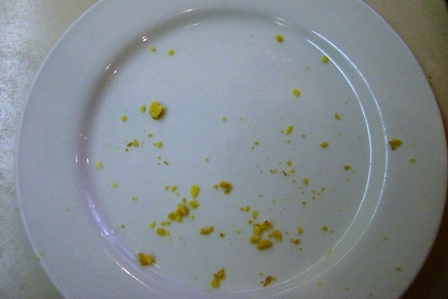 Makes you want to clean up the little crust-crumbs left on your plate. 10. 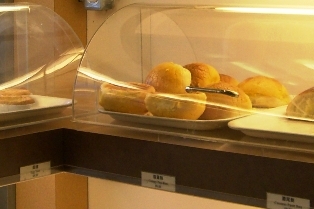 Freshness: Untouched by plastic trays – freshly baked and served warm. 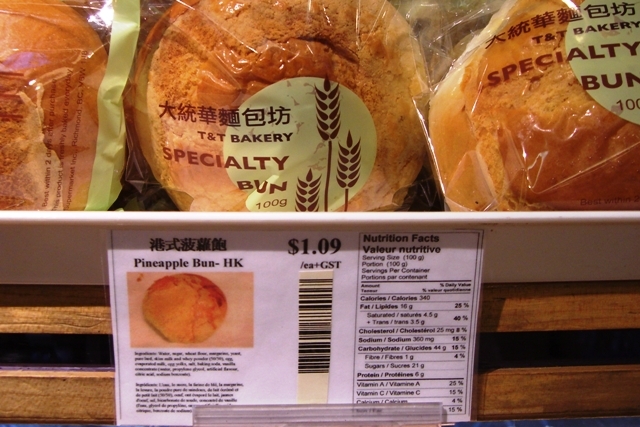 The perfect bun should not come in contact with any plastic or card board before being eaten. It should go directly from metal to ceramic. 1) The Fork: Present, but not used. The way it should be. 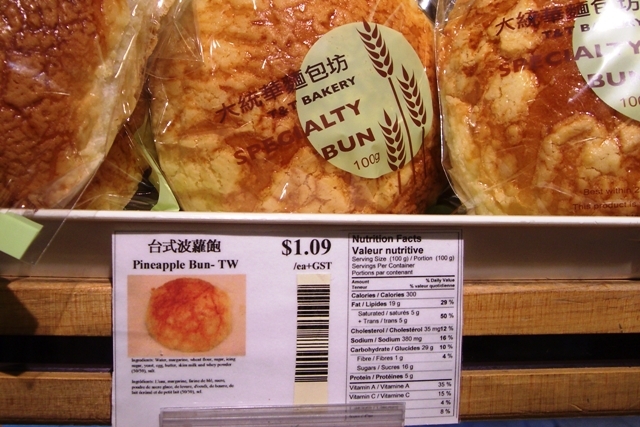 True pineapple bun experts will know to serve a pineapple bun with a lone fork. What is the purpose of this fork, you ask? Is it for the dainty to spear their buns so they do not have to use their hands (but then, should not a knife be present as well)? 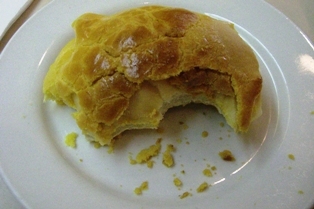 On that note, a good bun should always be enjoyed with your hands: If a fork needs to be used (and your hands are clean), that means you didn’t want to touch the bun, as something about it suggested that touching it will leave some kind of nasty, oily residue on your fingers, or will cause the crust to fall off. Neither of which should happen with a good bun. No. 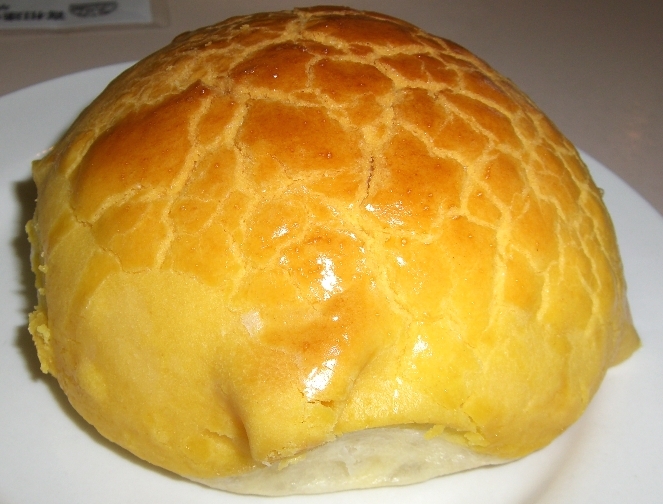 The real purpose of the fork is for mashing the entire pineapple bun down prior to eating it, such that the bun is manageable and the crust does not fly off as you eat it. (It is not a pretty sight, but it works.) In most cases, whether you employ this method is entirely up to you. (And I suppose a spoon would also do the trick.) However, in the case of the perfect bun, the fork should not be used because 1) as mentioned above, the crust already has excellent adherence, and 2) it would be too big of a heartache to cause such damage to a beautiful bun before eating it. But even if its purpose really is vestigial in the case of the perfect bun, the fork should still be served alongside, as it demonstrates that awareness of a higher-level, expert bun-eating. 2) Beverage: Milk tea. 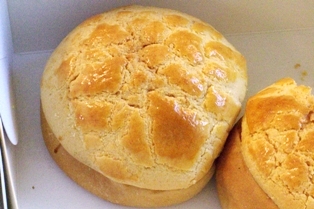 The perfect bun-accompaniment is very smooth Hong Kong-style milk tea, made with condensed milk. Hong Kong-style lemon-tea or Yin Yang (tea-coffee) are also good choices. Do not use water, plain tea (green, black or otherwise), or pop.